Culled from old medical illustrations and National Geographic, pornographic, motorcycle, and fashion magazine clippings, Wangechi Mutu’s writhing female figures have a dangerous beauty to them, one that’s grotesque and alluring all at once. A traveling exhibition — recently closed at Duke’s Nasher Museum of Art and opening in October at the Brooklyn Museum — surveys her experimentation with history, gender, and race since the mid-1990s. The show’s accompanying catalogue, Wangechi Mutu: A Fantastic Journey, is as valuable as the exhibition itself in looking at her art. While she’s best known for her collages that morph women from dissected forms, flipping through the papers with their carnal, scavenged tones, there is an order to it, a progression of examining all these severed sources. The Nairobi, Kenya-born artist lives and works in Brooklyn, but her sources are hardly limited to those two worlds. However, as Schoonmaker rightly points out, this is not collage of destruction, but “collage as repair.” Mutu is bringing together these convincing figures from slices of imagery of the long history of transforming the female body. Her “Riding Death in My Sleep” (2002) shows a leopard-print woman with some sort of insect lizard crawling on her shoulder, her full red lips and drawn eyes offering a dare of attraction that’s potentially poisonous. Yet often these woman and their surroundings are wounded, such as her wall installation “Hangin’ in Texas” where the wall seemed warm with festering pocks. There’s something both powerful and broken in all of these women who she creates from the fragments, picking them up from pieces into something fiercely reborn, but which can’t shake the harm of history that follows them. 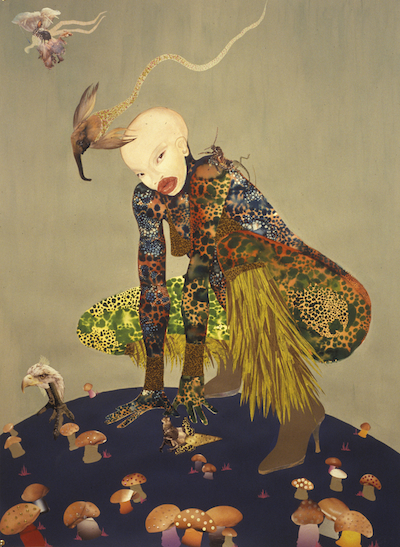 After the Brooklyn Museum, Wangechi Mutu: A Fantastic Journey travels to the Museum of Contemporary Art, North Miami, and the Mary and Leigh Block Museum of Art at Northwestern University. However, the catalogue is an impressive insight into her work on its own, although you’re left curious where Mutu will take this all next, as she’s instigated so many transformations in this beginning of her career.